We talk a lot about the fact that Shaller GoKarts are manufactured in Schulenburg, Texas. We are proud that our GoKart artisan builders have so much experience, and that we make our karts from raw metal in our own manufacturing facility. At Shaller, the customer and quality are front and center. We manufacture with pride, knowing our quality is the cornerstone of our custom manufacturing process. We are also proud that proprietors all over the world want to feature our GoKarts at their family entertainment centers and amusement parks. It’s exciting to know that people across the oceans are enjoying driving laps with their friends and family right now in Shaller GoKarts, whether they know it or not. Recently, we took an order for karts in Algeria. Do you know where Algeria is located? Most people probably do not, but it is in northern Africa on the Mediterranean coast, east of Morocco. Most North American’s probably don’t think of that area of the world as GoKart-Country, but we’re so excited that it is. 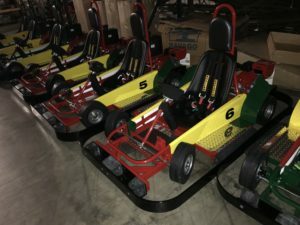 We recently shipped off another group of Karts to a family entertainment center also in Africa – this time in Ethiopia. One of the really unique features of these Karts is that they are custom painted in the colors of the Ethiopian flag. These Kiddie Karts, Rookie Karts, and Single Seater Shaller GoKarts are tearing up the tracks as you read this halfway across the globe. Most importantly, we’re excited to be expanding Shaller’s reach across the U.S., with new markets and family entertainment centers featuring Shaller GoKarts coming on each month. We look forward to meeting new friends and customers at F2FEC in March. As one of F2FEC’s newest sponsors, we believe support for the industry and this conference is vital to helping FEC owners and operators acquire the education they need to be successful. Part of that excitement is fueled by our new European-style GoKart, The Maverick. This Kart is built in the style of faster, Euro-Karts, but manufactured with the quality to stand up to demanding U.S. drivers. Check out photos of The Maverick Gas GoKarts and Electric GoKarts now featured on our Facebook Page. These are concession GoKarts, available only to GoKart tracks, family entertainment centers and amusement parks, in the U.S. and beyond. It all comes back to our Texas-engineered and designed quality GoKarts. Our GoKarts can stay driving on the tracks, hour after hour, generating revenue for their owners rather than headaches. Safety, durability, and performance are the key factors we include in every GoKart we build at Shaller. Quality and service are our focus! That’s why customers and owners come back to Shaller again and again, and why we are building new relationships in new markets every month.